Everyone’s heard of Jupiter’s four most famous moons Europa, Io, Callisto, and Ganymede—we’ve known about them for over 400 years, thanks to Galileo—but giant Jupiter has many more moons than that. To date there are thought to be 69 natural satellites orbiting Jupiter. 53 are officially named, while 16 are awaiting further confirmation. So you’d be forgiven for not being immediately familiar with all of them…it’s a big Jovian family! The little world seen above is one of Jupiter’s smaller and lesser-known satellites and it holds a particular distinction. It’s called Metis (pronounced like “meet” in the present tense, not “met” in the past) and it’s only about 37 miles across and 21 miles high. It is the closest moon to Jupiter, orbiting within the planet’s main ring (yes, Jupiter has rings) at a distance of about 80,000 miles. It’s also Jupiter’s speediest moon—at 70,500 mph it completes a single orbit in just over 7 hours. That’s almost three hours less than a Jovian day! The image above was captured by NASA’s Galileo spacecraft on November 6, 1997, two years into its 8 years in orbit at Jupiter. It’s a highly-upscaled version of a raw file I downloaded from NASA’s Planetary Data System (PDS) archive using SETI’s OPUS site. 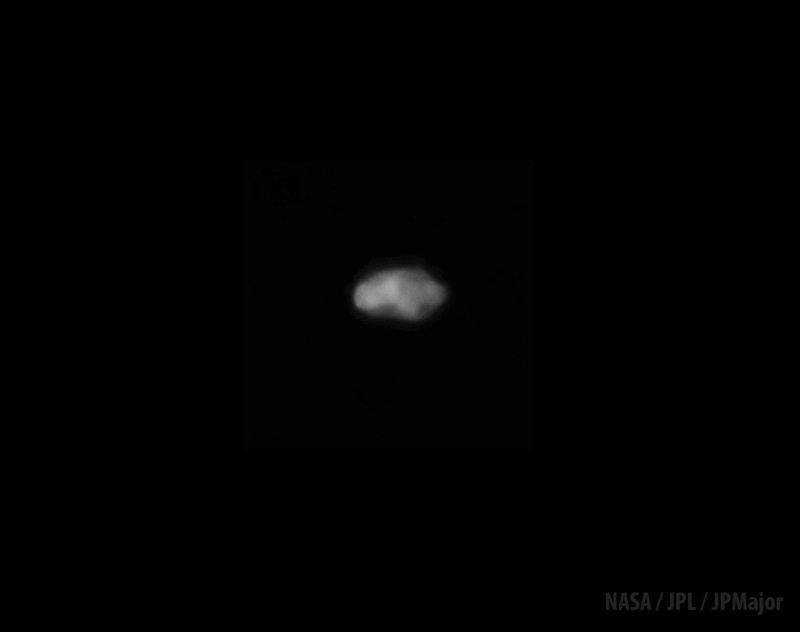 I’ve recently been looking into some raw data from older missions with the goal of processing better versions of things I had worked on in previous years using lower-quality preview JPEGs, and also finding some things I didn’t know about before. Metis is one of them! 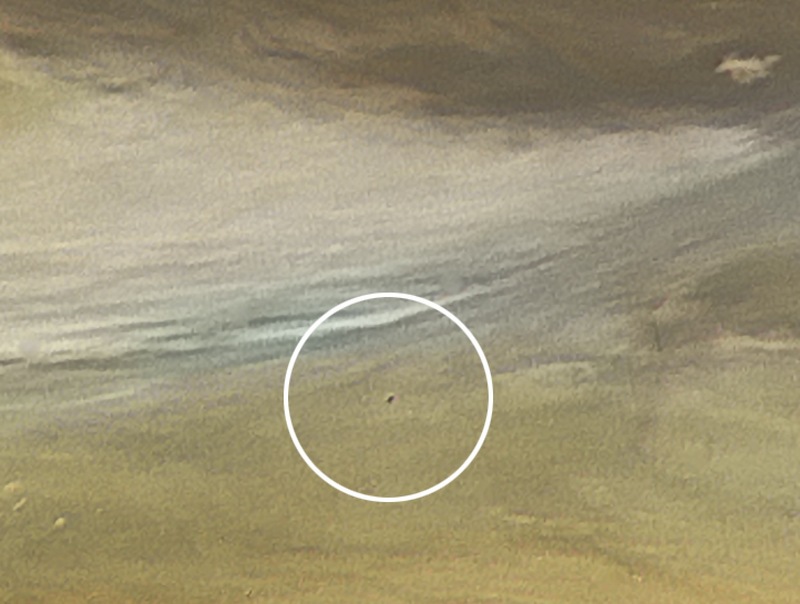 Galileo wasn’t the first spacecraft to capture images of Metis; actually Voyager 1 was. The moon was discovered by JPL astronomer Stephen Synnott in data acquired by Voyager 1 in 1979 during its flyby of Jupiter. 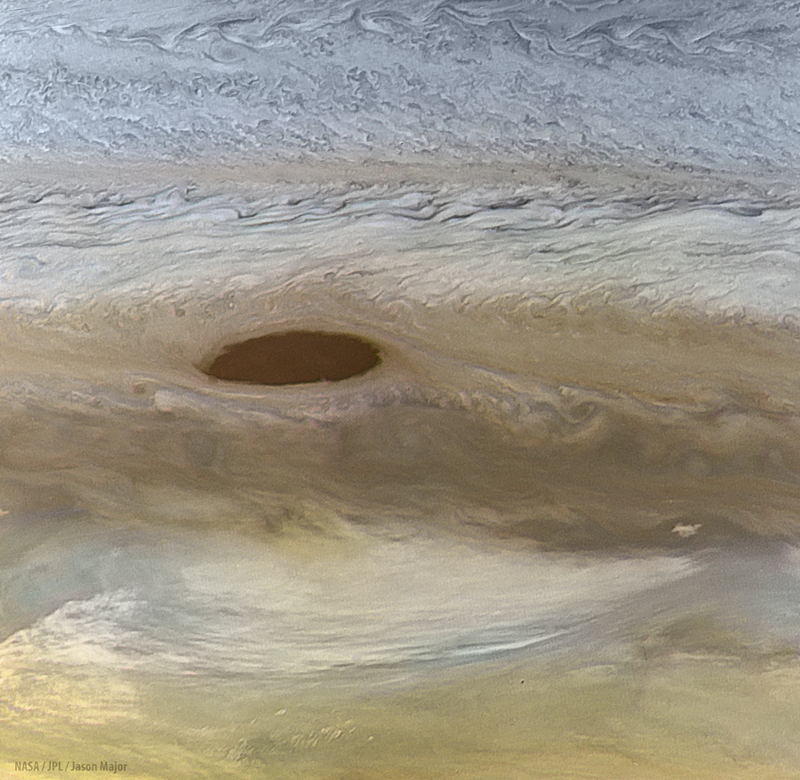 In March 4 of that year Metis was captured passing in front of Jupiter’s bands of swirling clouds…imagine its view! The image below is a color-composite I assembled from Voyager 1 observations in red, green, and blue visible-light filters. 37-mile-wide Metis is a tiny speck near the lower right. There are three other inner moons of Jupiter in addition to Metis, which is the closest—Adrastea (the smallest and the only other inner moon to orbit faster than a Jovian day), Amalthea (the largest and first-known), and Thebe (rhymes with Phoebe). All orbit between the rings and the orbit of Io, the innermost of the four Galilean moons. We don’t know that much about Metis, other than like the other inner moons it’s quite dark (albedo of .06) and is probably made mostly of water ice, based on density. 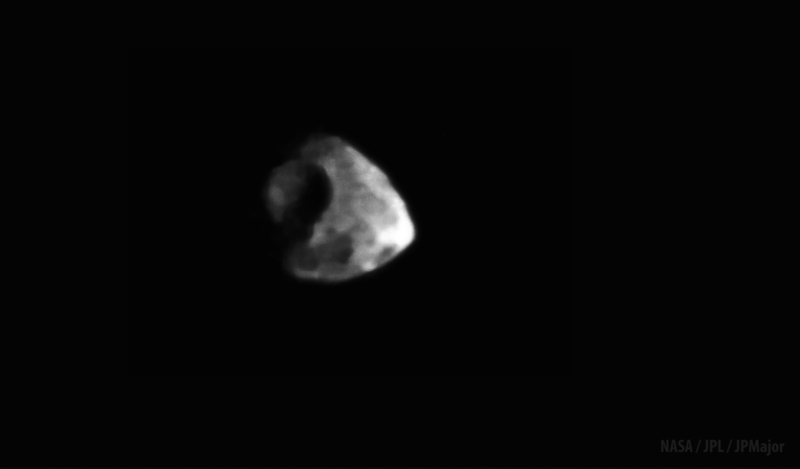 Learn more about Metis here, and find a full list of Jupiter’s known moons here. I would have thought that being made mostly of water ice, it would have a high albedo, being MORE reflective, therefore lighter. But 0.06 is very dark. How do we jibe the two statements? The inner moons are dark from multiple possible sources: staining from material ejected off Io; material from the rings; and “baking” from radiation exposure between solar UV and Jupiter’s magnetic field. Ice is relatively transparent, certainly compared to other common substances. So it only takes a bit of impurities to affect the light signature. The reflectivity- at least, in optical wavelengths- is determined by a surprisingly shallow layer of the object. The fact that you don’t see it doesn’t mean it’s not there, and that fact that you see it doesn’t mean your eyes are accurate instruments. That’s called naive realism. It’s hard to even imagine that speed. You have some awesome content here and keep up the good work! Thanks for the really wonderful photos. i am so greatful there are people who have the interest and talent to learn of that thing they are interested in, and then they are willing to share their hard work with the rest of us. thank you for your interest and hard work. that’s really fast for a messenger!! =) thanks for sharing all the info, very nice read!! Wow…this was so interesting to read!! After what was seemingly an endless strike, Meru university students are finally being called back to school, was the death of their student leader all in vain? Follow us on https://mashreviewsblog.wordpress.com/2018/04/17/meru-university-of-science-and-technology-sudents-set-to-report-back/ as we are set to bring you exclusive turn of events as they occur from the inside of the school. Fascinating read! Thank you for sharing. Thanks for the info, i really appreciate, i didn’t know about this all.